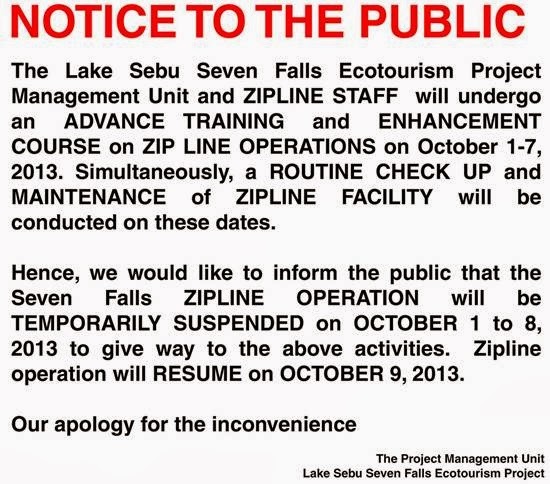 The operation of the Seven Falls Zipline in Lake Sebu has been suspended since Tuesday, October 1, 2013 for a scheduled training of zipline staffs including maintenance and routine check-up of the zipline facility. The Seven Falls Zipline in Lake Sebu is considered the highest in South East Asia with a height of more than 180 meters. It passes over four (4) waterfalls. According to a notice by the Project Management Unit of the Lake Sebu Seven Falls Ecotourism Project , the temporary suspension of the Seven Falls Zipline will last until October 8 and expected to resume operation on Wednesday, October 9. 2013.